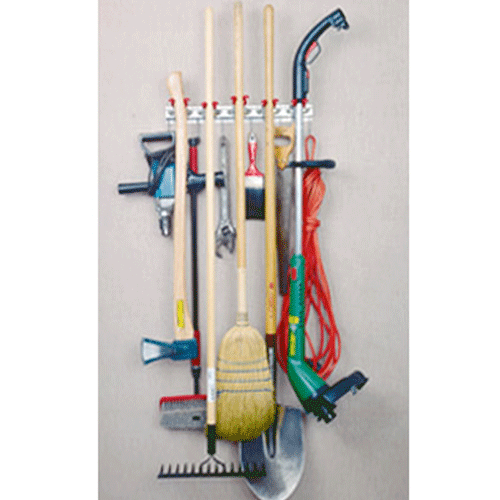 Our Surelock® Tool Organizer, with it’s spring-locking action, is the perfect organizer for your home or garage. 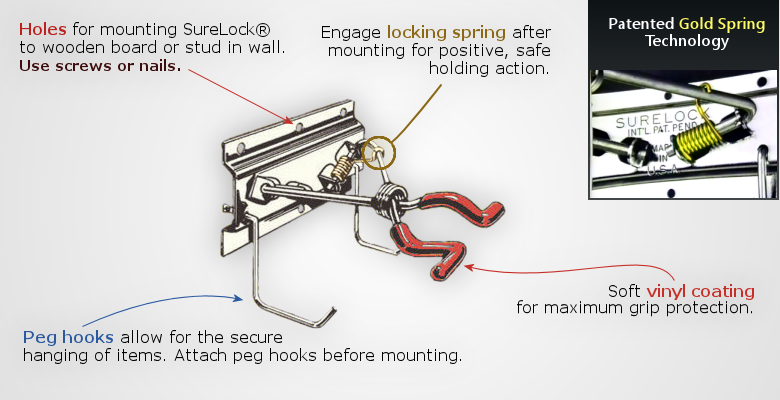 The SureLock® Tool Organizer w/ SpringLock® doesn’t just hold your items, it locks them in place. You may have seen imitations on the market, but the SureLock® HangAll is the only tool organizer with a unique patented safety spring locking action. Items stay in place, even when accidentally bumped or shaken. 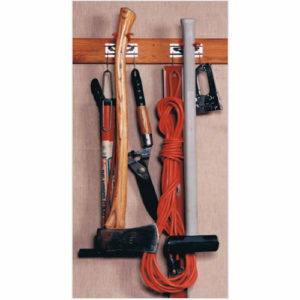 The SureLock® Tool Organizer w/ SpringLock® mounts easily to any wall. 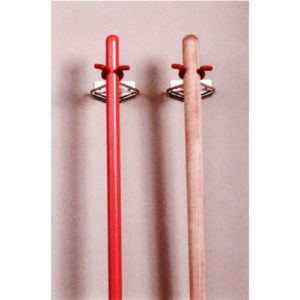 Its two gravity, self-adjusting spring locking arms hold any handle securely. 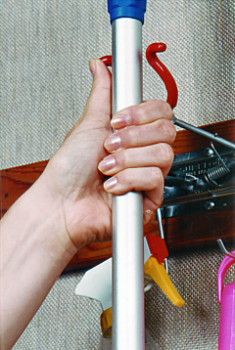 Simply push the gripper arms all the way up to release the item. Large, permanently attached peg hooks offer a multitude of valuable storage capacity. 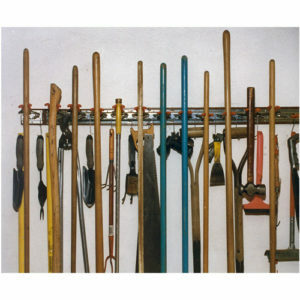 Where Can I Use My Surelock® HangAll Tool Organizer? 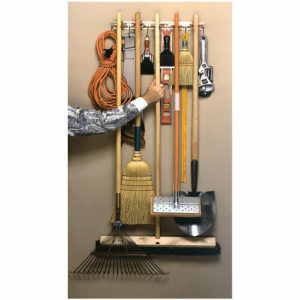 The handy Surelock® HangAll Tool Organizer can be used almost anywhere in your home or garage. Use it in basements, laundry rooms, recreation rooms, in a pantry, or even inside of walk-in closets. Your own imagination is the only limitation, as the Surelock® HangAll tool organizer is very practical and can easily be customized to suit just about any environment. Your Surelock® HangAll Organizer or Surelock Singles can be mounted in different ways, in many places of your home, garage, or business. It is best suited for mounting the metal channel directly to wall studs, or even to wooden boards or beams. 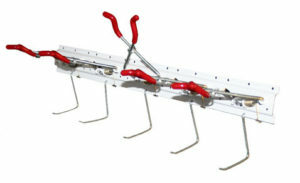 Insert the permanent peg hooks into metal channel before mounting to a wall or board. 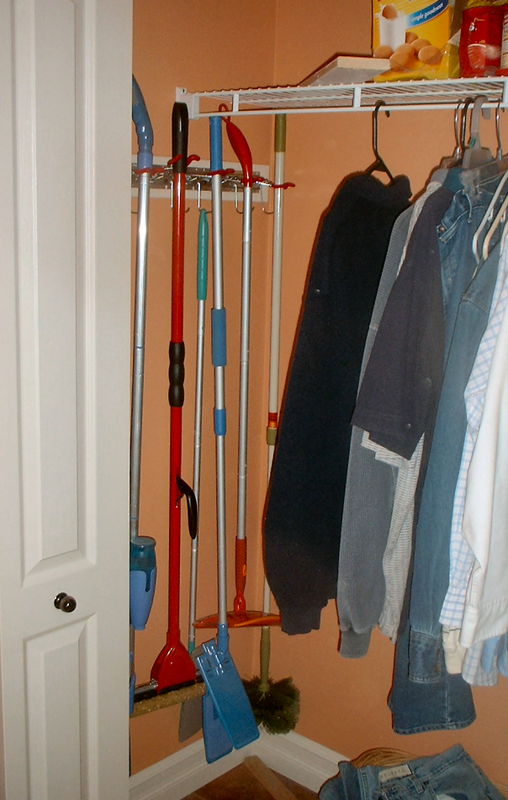 Always install your Surelock® HangAll high enough from ground level to maximize its use, and hang taller items, such as brooms and shovels. However, be careful not to install channel bracket too high up, as this may increase the risk of injury, or damage to items from falling, when hanging objects are harder to grasp from stretching or reaching up.